Does the Newly-released iPad Mini 4 Meet Your Expectation? The widely-anticipated iPad Mini 4 is finally surfaced at Apple's release event in San Francisco. Boasting perfect hardware upgrades, the renewed iPad Mini 4 is packed with 7.9-inch Retina display with 2048*1536 resolution (4 times the resolution of the previous-generation), Apple's newest 64-bit A7 processor (up to 4x the CPU speed and 8x graphics performance), M7 motion coprocessor and maximum 128GB capacity. For YouTube addict, it couldn't be better to play YouTube videos on iPad Mini 4's retina display. However, there always are some unavoidable problems bothering you. The most knotty one is network connection. The snail-slow speed may easily annoy you when you are watching some YouTube video cheerfully. Worse still, how do you watch YouTube videos on the device when you are out or when Wi-Fi does not work? Honestly, the best solution is to save YouTube to iPad Mini 2 ahead of time for offline playback. 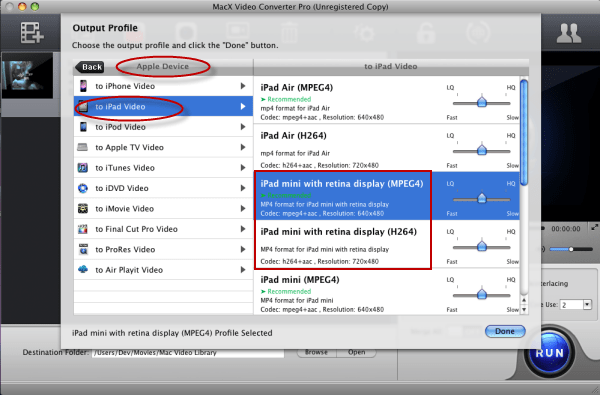 Luckily, MacX Video Converter Pro is just a powerful tool for you to download YouTube to iPad Mini with retina display. Enjoying high popularity among its users, this program acts not only as the best YouTube downloader that can grab videos to iPad Mini from YouTube, Vimeo, Vevo, Metacafe and 300 more online sites with intact quality, but also convert YouTube video to iPad Mini 4 friendly format, be it MP4 and H.264 with the world's fastest speed. With this YouTube downloader for iPad Mini with retina display in hand, you can easily download favorite YouTube videos to iPad Mini 4and play them on this iPad Mini with retina display freely without any worries. World's fastest YouTube to iPad mini 2 downloader to download any video from YouTube, 300 more to iPad Mini with retina display/Pro/Mini 4/Air 2, etc. with 4K UHD, 1080P, 720P HD in secs only. Besides downloading YouTube to iPad Mini with retina display, MacX Video Converter Pro, with excellent HD video converting feature, also endows you to convert HD videos, like MKV, M2TS, MTS, AVCHD videos, to iPad Mini 2/mini 4/Pro/Air 2 and more with no difficulty. Therefore, you can feel free to play both YouTube video and HD videos on your iPad Mini with Retina display as you want. 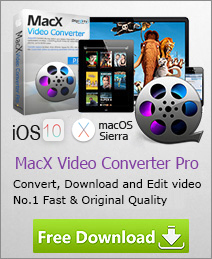 Notes: MacX Video Converter Pro is especially designed for Mac users to download YouTube video to iPad Mini 2. If you are a Windows user, please head to the Windows YouTube to iPad Mini 2 downloader to get the job done. Step 1: Download YouTube Video. After installing and running this program on Mac, hit the "YouTube" button on the main interface, the built-in YouTube Downloader window will pop up automatically. Copy and paste the YouTube video URL to the address bar and then click "Download Now". Step 2: Convert YouTube Video to iPad Mini 4 Supported Format. After finishing YouTube downloading, the downloaded YouTube video will be automatically added to the convert list. To convert YouTube video to iPad Mini 4 recognized video format, you can simply hit Apple device-> to iPad Video-> iPad Mini with retina display (MPEG4/H.264) and then press "Done". Tips: With 280+ profiles infused, this iPad Mini 4 video converter can jump through hoops to help you convert any videos to your mobile gadgets, for example, AVI to iPhone 5S, MTS/M2TS to iPad, MKV to WP8, etc, while delivering up to 5x faster speed and original video quality. After finishing the steps above, click "RUN" button to start to convert the downloaded YouTube video to iPad Mini with retina display. You could view the conversion progress and are able to cancel the converting process at anytime. Everything is ready. You just need to transfer the YouTube video to your iPad Mini 4 via iTunes and then you can play YouTube video on iPad Mini with retina display anytime anywhere.